Promises, an award-winning documentary directed by B. Z. Goldberg, Justine Shapiro and Carlos Bolado, is not a film about answers to the ongoing Israeli-Palestinian conflict, but it means to pry open a way for peace by encouraging understanding, dialogue, and personal friendship between individuals whose lives are variously shaped and shattered by the situation. Significantly, in this powerful and inspiring film the most promising candidates for reconciliation are children aged nine to 12 years. This focus on children largely creates the film’s artistic charm and ideological challenges. Promises was shot between 1995-2000 in Jerusalem and the West Bank during the era of relative calm after the First Intifada and the 1993 Oslo Peace Accords, which were witnessed not only by the then Israeli Prime Minister Yitzhak Rabin and PLO leader Yasser Arafat but also by US President Bill Clinton, among others. The film’s young interviewees include secular, Orthodox settler and ultra-Orthodox Old City Jews as well as Muslim Palestinians whose experiences are largely determined by whether or not they are refugees. This cultural cross-sectioning serves immediately to challenge the usual simplistic dichotomies in the Israeli-Palestinian conflict, and Goldberg — an American Jew conversant in Arabic, English and Hebrew — befriends the lot of them, helping to make for the possibility of intercultural relationships. Throughout the 106 minute documentary, viewers listen to a seemingly developing discourse between the children as the separate interviews are juxtaposed with one another. Though each interviewee lives discreetly different than the others, separated as they are by multiple political boundaries and military checkpoints, they also experience parallel and sometimes shared interests in family life, religion and sports. There are the Israeli twins Yarko and Daniel who play volleyball, Shlomo who studies in skullcap and starched uniform, Moishe and sister Raheli who live inside a chain-link settlement enclosure, the Palestinian Muslim Mahmoud who freely visits the al-Aqsa/Temple Mount complex to pray, and Sanabel the dancer and Faraj the runner who live in the Deheishe Refugee Camp in the West Bank. On both sides, family members and neighborhood friends die in local skirmishes, and most of the children live not more than a 20-minute drive from the others. Perhaps ironically, even when they most strongly express opposition to those on the other side of the political conflict, the children often identify precisely the same frustrations and provide similar reasoning for arriving at their very different views. However, as a respite from the cacophony of voices, the interviews are also at one point broken up (silenced?) by a stunningly beautiful musical interlude. As a warbling sun rises over ethereal Jerusalem, a God’s eye view camera pans across the ancient skyline of a thoroughly modern city and then begins bursting into a series of snapshots of its famous holy places before settling down to gaze almost lovingly on the contrasting, demonstrative, absolute, personal devotions of the various individuals who share — and belong to — Jerusalem. Elsewhere, in an echo of the earlier visual interlude, unnamed Palestinian boys send a burning tire rolling down a hill toward heavily armed Israeli soldiers: the soldiers notice warily and yet remain at their posts. So conflict continues — beyond everyone’s control but not beneath their care. But the despairing nature of Faraj’s prediction — which proves true, we’re told in hindsight — hardly lives up to the usual goodwill inherent in a promise. For if there is a dichotomy beyond the Israeli-Palestinian one that remains unresolved in Promises, it is that of the powerless and powerful. In the film, the children are powerless to change the political will that seems determined to keep them apart, and in this regard they stand for all the powerless who often suffer at the will of the powerful. The problem is that for promises to become a positive reality there must be an enabling social will that serves as a mediating force. In this regard, Goldberg and crew are more than documentarians for their film project: they are the superstructural creators for cross-cultural relationships and friendly interpersonal dialogue. At the official Promises film website, the directors still express a sense of duty to the film’s principal interviewees and promote use of the film in educational settings where teachers can guide students to interact with its subject matter. Educational use of Promises is a natural extension of the work done in the film itself. Promises’ educational legacy may also now be critically important since the opportunity to make such a film is, regrettably, past. At one point in the film, Mahmoud expresses his admiration for B. Z. by identifying him as an American rather than a Jew, or at least an American Jew rather than even a Jewish American. 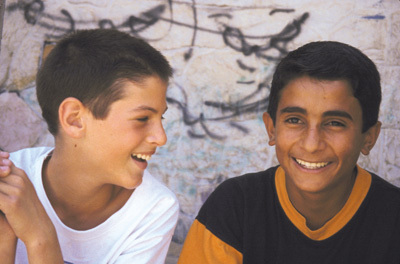 Because Goldberg is an American, Mahmoud allows him to be a mediator and a friend despite generally tense relations between Palestinians and Israelis. B. Z.’s identity as an American helps make him a neutral and, therefore, positive force at the time the film was shot. Since the making of Promises the status of Americans has changed worldwide — not for the better — and particularly among Muslims. So if there is a lesson to be taken from Promises beyond the notion that peace comes through dialogue, it might be that the role of mediator in negotiating successfully between peoples and their disparate ideological worlds — however subtle such a role may first appear — is crucial in realizing the goodwill inherent in promises. Wow, I strongly congradulate the creators of this movie. It was the greatest demenstration of how this can be stopped. CHildren may be just children but ,as they should, they have a say in what’s going on here. Israeli and Palestinians should own the land but it’s in the future holders of the land to have a choice. Yarko and Daniel need to be able to have their kids and grand kids ride bus 18 and that’s in the hands of us and how we’re going to help stop this from continuing. I’m proud to say that this movie will change that for them and it’s goind to be for us and the sake of our future leader’s including me as I grow to be an adult with a vision in this large nation. If more and more kids don’t leave it alone, then what Faraj said will be true. They will remeber what their fathers went through and they’ll use that as an excuse to fight them back. I’m again really happy and proud and speehchless about this movie. I cried to see so many innocent deaths and they shouldn’t need to continue. It’s a slow Holocaust and we shouldn’t have to remember people/kids but have them stand right next to them. Than You so very much for letting me get this oppurtunity to say my thoughts and I will further want to speak to anybody and have an actual conversation about this event and also about what we can do as a nation to change this. This movie is truely inspiring and hats off to u B.Z Goldberg! We saw this movie in my World Geo class and we really liked it. I like Fajar, i think he is really cool and funny. in the end i thought that Sanabel looked really hot. I have been showing this movie to my classes for 6 years now and every year my students are enlightened and touched by it. They always want to know where these children are and what their lives are currently like. I have found information about Faraj, but not the others. Anyone know how to find out?